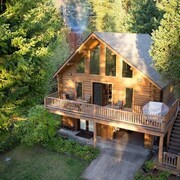 Situated on a lake, this romantic vacation home is within 1 mi (2 km) of Yellow Bay and Flathead Lake. Flathead National Forest is 7.4 mi (11.9 km) away. The location is very convenient and the scenary is perfect. The parking lot was a bit messy. Love the idea of having pet permitted but should provide doggy bags and informed signage to pick up after their dogs. Where to find Polson hotels near an airport? Where can I find hotels in Polson that are near tourist attractions? For those who are visiting Western Montana and are after a basic or more upscale room in Polson, there are a few alternatives. About 3 Expedia-listed accommodations lie within easy driving distance of Polson's center. One of the ingredients to stress-free traveling is convenience, so be sure to have a look at the KwaTaqNuk Resort & Casino and Americas Best Value Port Polson Inn, all of which are located within 1 kilometre (0.6 miles) of Polson's downtown area. Two Expedia-listed hotels that could be ideal are the Gaynor Ranch Bed & Breakfast and Red Lion Ridgewater Inn & Suites Polson. The Gaynor Ranch Bed & Breakfast is located 11 kilometres (7 miles) away from downtown Polson. The Red Lion Ridgewater Inn & Suites Polson is located 3 kilometres (2 miles) away. Another great options is to enquire about booking a room at the Ninepipes Lodge. This Expedia-listed hotel can be found 30 kilometres (18 miles) from downtown Polson. Why don't you see some more of the lakes that are commonly found in in Western Montana? Choose to spend a few extra nights in other parts of Western Montana. Spend your time snowboarding, skiing and cross-country skiing or visit the region's attractions. Comfortable hotels are available. Missoula is 90 kilometres (57 miles) to the south of Polson and is where you'll find Southgate Mall and Splash Montana. Should you wish to stay in Missoula, check out the room rates at the Gibson Mansion Bed and Breakfast and DoubleTree by Hilton Hotel Missoula - Edgewater. Or, you could consider staying in Columbia Falls, 75 kilometres (47 miles) to the north of Polson, where you can choose from the Meadow Lake Resort and Western Inn-Glacier Park. Whether you're just passing through or staying in Columbia Falls, set aside some time to check out the Meadow Lake Golf Course and House of Mystery and Montana Vortex. Before you head home from Western Montana, make sure you experience some sport. Visit Washington-Grizzly Stadium to the south of Polson. 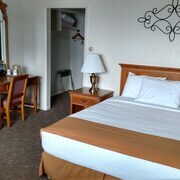 Book accommodation near the action at the Holiday Inn Downtown - Missoula or the Comfort Inn Missoula. Expedia's travel listing is also a great way to discover more about Polson. What are the most popular Polson hotels? Outdoorsmans Paradise, a Place to Hunt, Fish, and Enjoy the Great Outdoors! 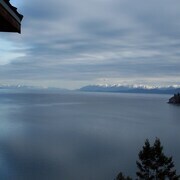 Stylish & Convenient Residence W/sauna & Grand Deck Overlooking Flathead Lake! Are there hotels in other cities near Polson? 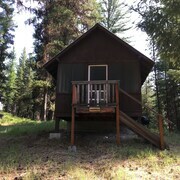 What other types of accommodations are available in Polson? Explore Polson with Expedia.ca’s Travel Guides to find the best flights, cars, holiday packages and more!